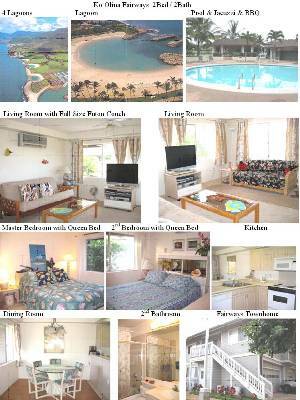 Not too far from dolphins, deep sea fishing and diving/snorkeling and tennis.15 minutes west of Ko Olina is the culturally local area of Makaha with the best priced, studio and one bedroom, oceanfront condos in all Hawaii--all with great ocean views, etc. Makaha condos are older with spectacular ocean views, and 2 newly renovated pools, BBQ, beach access and exercise room, covered assigned, covered parking, a/c, fans, kitchen, tub/shower and are all wheel chair accessible experience and enjoy the local people and maybe learn some the cultural and aloha lifestyles. Near the famous Makaha surfing beach, the beautiful Makaha Valley, ”land of peacocks,” where the ocean/mountain/valley view condos stand against the majestic Waianae mountain range is the peaceful and tropical Makaha Valley Towers one bedroom central a/c and sit-out viewing lanai condo. 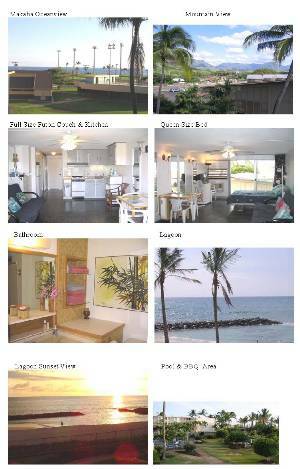 Please call or email for more pictures, makaha’s lowest island prices, detail info and directions --do not forget to leave the dates you are interested so we can hold something for you immediately, last minute bookings also possible, mahalo. Our 2br2ba,nearly 900sq ft. 2nd story, mountain, moon and sunrise condo at Ko Olina is the newest, largest, peaceful and uncrowded resort/marina in Oahu on the sunny side of the island just 30 minutes west of the Honolulu airport .The new Kapolei town is next to the newest development area of Oahu, Ko Olina resort/spa and marina, which has the island’s best luau, championship golf, and 4 beautiful swimming beach lagoons. This romantic resort is located near stores, food, swimming theme park and 16-plex theaters. 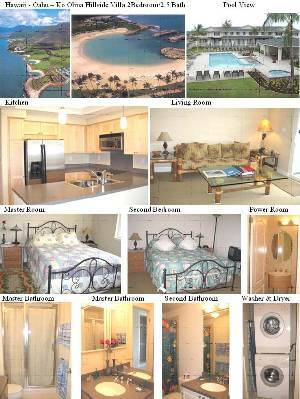 Ko Olina condo has everything you will need and more with master bedroom, a/c, fans, phone, washer/dryer, beach stuff, etc. pool and jaccuzzi and BBQ are in the complex too. $100.00 Security Keys/Damage Deposit Refundable. Cancellations and Refunds: A deposit can be refunded with a 30-day notice of cancellation. No shows and cancellations with less than 30 day notice, the deposit will be forfeited, unless we can re-rent.